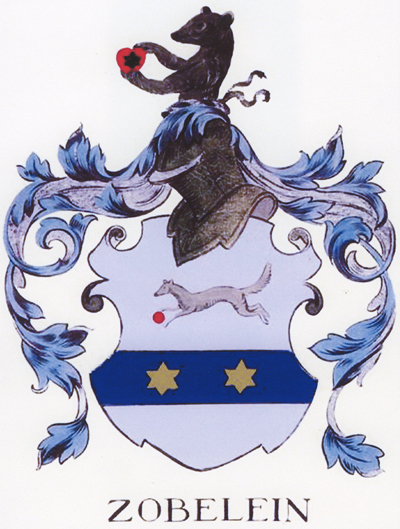 The German word for sable is "zobel" - thus the sable incorporated into the coat of arms. This also explains the name given to the apartments owned by the Zobelein family in Los Angeles (on the site of George Zobelein's estate) - the "Sable Arms". Above the doorway on the building is a replica of the coat of arms. Arms: White, with a blue fesse (horizontal bar representing a military girdle) and two green six-pointed mullets (stars) which symbolize achievement and honor. Above this is a running sable holding between its paws a torteau (cake of bread eaten before long battles). Crest: A demi bear (symbolizing a fierce defender) rising above a knight's helmet, holding between its paws a red heart (red for fortitude and the heart for gentleness), surmounted with another star-shaped mullet. Would you like something with the Zobelein coat of arms on it? During the 2001 family reunion in Los Angeles, there were glass mugs given out with the coat of arms etched onto them. The etching was done by Champagne Recognition in Carlsbad, CA. If you would like to order something with the coat of arms etched on it, you may call them at 760/931-5766. please e-mail Serena Zobelein Farrell.